Sixty-three FLEX Alumni from Moldova, Montenegro, Serbia, and Ukraine attended a skills training workshop in Costesti, Moldova on November 12-15. The workshop consisted of trainings to develop alumni’s capacity to organize events and trainings in their home communities in the theme areas of human rights, sustainable development, anti-corruption, and English language instruction. A goal of the FLEX-Ability workshop series is to have senior alumni lead trainings to support the development and share knowledge in their professional fields with younger alumni. 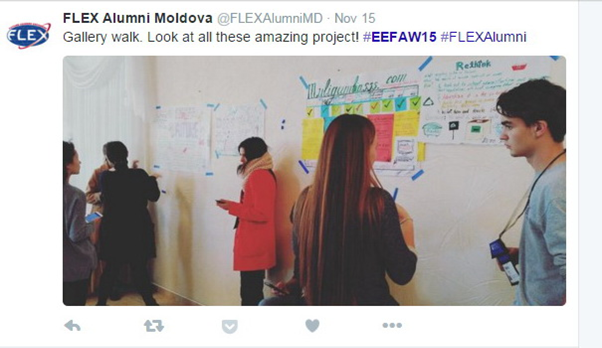 At the Eastern Europe FLEX Ability Workshop, FLEX and UGrad program alumni trainers worked alongside Peace Corps volunteers and American Councils staff members to train alumni. The training team included: Halyna Yanchenko ’04 from Kyiv, Ukraine (Anti-corruption), Valeria Svart ’07 from Chisinau, Moldova (Sustainable Development), Igor Zlatojev ‘07 from Petrovac na Mlavi, Serbia (Human Rights), Danka Markovic, Ugrad alumna from Podgorica, Montenegro (Human Rights), and Serhiy Zdrok ‘15 from Dnipropetrovsk, Ukraine who assisted with the English Language teaching group following his participation in the Workshop for Youth Leaders of Teaching English. The workshop consisted of trainings in one of the four theme areas, combined with an overview of project management and development skills sessions. Alumni also attended site visits to learn more about local and international organizations that work in the theme field to improve communities in Moldova and around the world. The Human Rights group visited the United Nations Development program (UNDP), where they learned about the history of the UNDP and specific projects that the organization has held in Moldova, including the creation of a nation-wide effort to offer Braille voting instructions and ballots for those with vision impairments in Moldova. 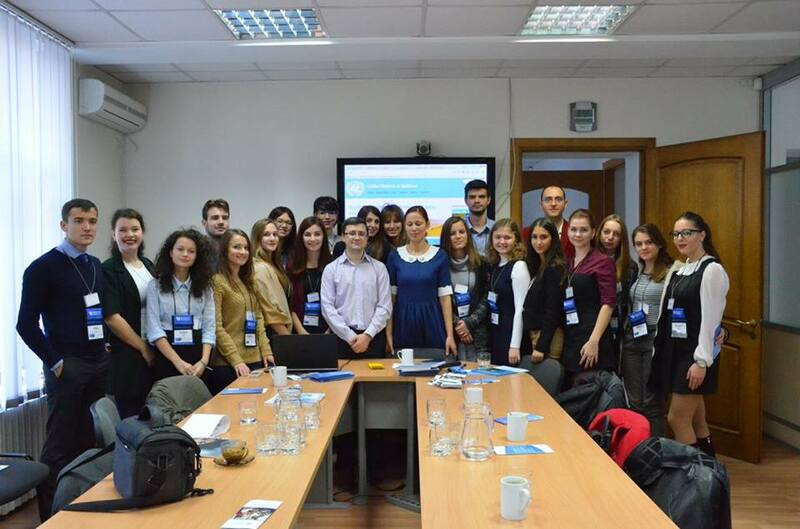 The Anti-corruption group visited Transparency International in Chisinau, while the English Language group visited sessions at the English Language Resource Center and browsed through the teaching materials. The Sustainable Development group visited the Moldovan NGO EcoVisio, with a presentation by its co-founder, their very own trainer Valeria Svart ’07 and visited the offices of the National Environmental Center in Moldova. The ultimate goal and requirement of the workshop are that alumni participants use the knowledge and skills developed to hold no less than two follow on trainings and events in their home communities, sharing the skills and knowledge learned at the workshop with their fellow alumni and peers. At the close of the workshop, alumni shared abbreviated presentations of their theme sessions to introduce all groups to the themed group materials. Alumni also presented the individual or team project that they would like to organize upon returning home. Some of the projects include; a summer camp to educate children about the signs of corruption and how to put an end to it at the grassroots level; a human rights campaign to offer free-of-cost school lunches to children in need; the opening of an English language resource center in a rural area of Ukraine; a debate club focusing on human rights discussion and debate; a cultural heritage and preservation project in Serbia; and the development of community gardens in communities across Moldova. To date, alumni have submitted 19 proposals to request funding for individual and group projects in their communities. Many other workshop participants have held and are organizing free-of-cost events. 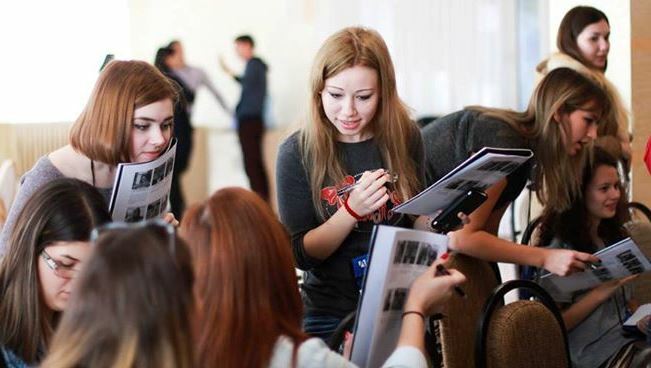 Outside of the classroom, this workshop was a first-of-its-kind opportunity for FLEX alumni from Moldova and Ukraine to welcome and interact with alumni from Montenegro and Serbia, two countries that are new to the FLEX community, and vice versa. Alumni participated in teambuilding exercises throughout the workshop and shared their culture and national dance during evening activities. These informal and networking opportunities offered alumni the chance to learn about their neighbors, share ideas for projects, and discuss ideas and themes from their workshops. Alumni, trainers, and staff aimed to share the workshop activities and atmosphere with their social media followers by posting and offering insights to the work and fun of the workshop, online! 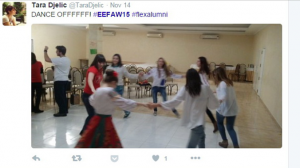 Using the official hashtag #eefaw15 (Eastern Europe FLEX Ability Workshop 2015) and other hashtags used regularly by FLEX alumni, the workshop posts reached 474,235 (unique) people with the 1,390 workshop posts on Twitter and Instagram (Facebook does not offer significant insight regarding hashtags, hence its exclusion from the statistics). 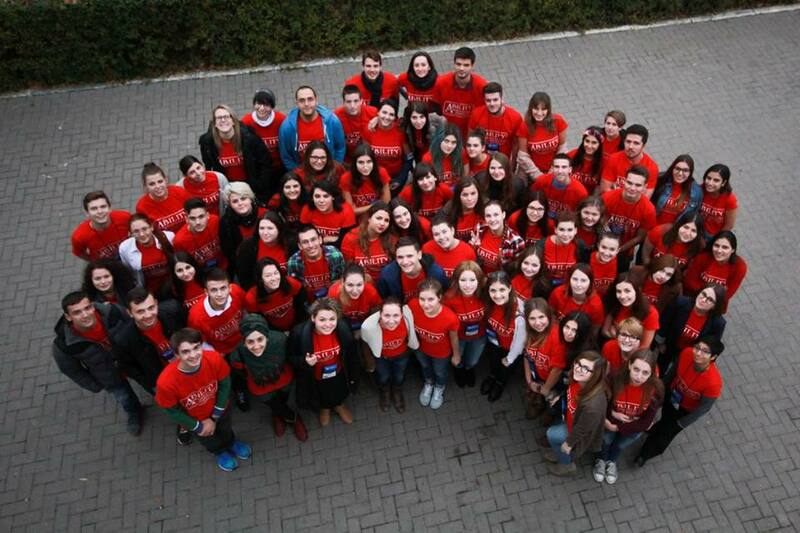 Workshop participants include alumni from Ukraine (18), Serbia (16), Montenegro (16), and Moldova (13). Alumni were chosen through an application process and local office review to attend the workshop. Additionally, the FLEX Alumni Coordinator(s) from each country attended to support workshop staff and their country delegations. The workshop photo album can be found here.